rain on the kitchen window when i come down for breakfast in the morning is never a great sign. essentially, it means that only a metre or two beyond those wet panes of glass is a damp bike shed containing a number of bicycles all huddling towards the back in the hope that each will be spared the ignominy of being dragged into the cold and wet. that rain rarely hits the glass square-on, for the prevailing wind usually attacks from the right, though occasionally from the left. surprisingly, almost never straight on. if it arrives from the left, the frontmost of those bicycles is going to have a wet top tube. for reasons outwith my grasp, the door of the bike shed has dropped a centimetre or so at the left, leaving a small gap at the top allowing for ingress of windswept precipitation. i have a cure for this (fitting a panel of wood across the top), but in the manner of the inept craftsman (?) it'll only happen when i get around to it. until then, i like to think it helps air the contents. according to general consent, in this part of the country (western scotland) we're likely to get rain around 250 days per year, leaving a mere 115 when i can expect to remain dry. of course, this only posits the number of days on which rain might be expected at some point of the clock, not necessarily a meteorological feature that will fill each waking hour. thankfully, one of those 115 days happened by earlier this week, or at least, i thought it had happened by. the period between christmas eve and hogmanay is traditionally the festive 500, a challenge successfully completed over the last two years, though not at all dry in 2011. thus, on each morning, after observing the rain-speckled windows in the kitchen and having devoured a hero's breakfast of porage and peaches, i would be more than inclined to cover my cycling shoes with overshoes. 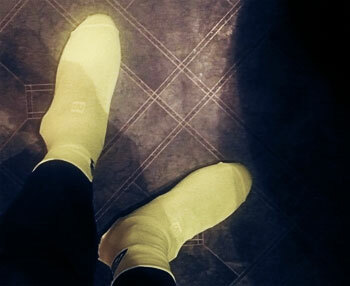 on the particular morning under discussion, i opted to alter this habit, and keep tootsies cosy by means of a pair of distractingly fluorescent yellow cordura oversocks from the dynamic duo at prendas. my reasoning was two-fold; firstly, at the time of so doing, not only was it not raining outside, the clear sky observable to the southeast suggested the day might truly be bereft of precipitation during my velocipedinal perambulations. add to that my disturbingly early start, wherupon the light outside was not yet do-able without artificial illumination. with a chartreuse jacket, fluoro oversocks, flashing tail light and a headlight that would do justice to a boeing, i have little doubt that i was visible from the international space station. of course, those with perhaps a tad more savvy about them than i, will have realised that my meteorological observations extended only as far as the south west and partially to the south east. it should not come as too much of a surprise to know that the impending doom arriving from the northwest had escaped my gaze. thus, in the process of gathering more kilometres towards the grand total (just passed the auction mart at bridgend, now that you ask), it rained. it is fortunate that this rain expressed itself as only a brief shower, for though the oversocks were brighter than the midday sun, as well as commendably warm, waterproofing was/is not one of their many merits. i have not yet entirely come to terms with the machinations involved in wearing oversocks of any particular hue. the late frank vandenbroucke was one very much in favour of wearing such apparel on a regular basis, an affectation i thought more akin to a perceived sense of style rather than for any pragmatic need. david millar is another who has, on occasion, shown a predilection for a similar mode of dress. while i have been accused of many a misdemeanour, being stylish is certainly not one of them, and i have thus previously refrained from oversockness to avoid such finger-pointing. however, under the circumstances (a need for foot insulation and ostentatious visibility), i really cannot recommend these highly enough. on suffering a puncture a mere 2.5km from home, i removed the oversocks lest they should become tattered while wrestling with tyres, levers and inner tubes, and i can attest to the observation that both feet suffered a noticeable drop in temperature. anxious to avoid yet another impending rain shower, i mistakenly forgot to replace them before pedalling homeward; oh, silly me. while neither i, nor anyone else would recommend these as a substitute for regular water-resistant overshoes, beloved of accurate belgian impersonations, they do suggest themselves for those frank vandenbroucke moments of style, or simply as a way to keep your feet warm. and it takes only the merest hint of time to get used to that brightness of yellow. 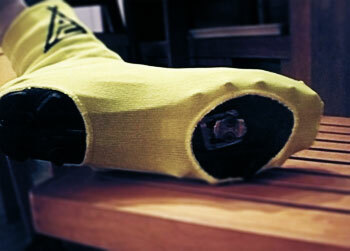 if fluorescent yellow is not entirely to your taste (or that of your immediate peloton), prendas can also supply the selfsame cordura oversocks in black or white for the highly reasonable asking price of only £7.95. all shoe sizes from 37 to 47 are catered for.